The passage of Proposition 8 in California was a devastating blow to gay rights in America. 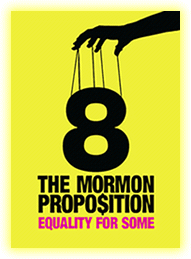 And, at least according to the central conceit of 8: The Mormon Proposition, its success was due to funding and support from the Mormon Church. The documentary attempts to show how the church quietly rallied its members around this cause for what was initially an unpopular provision, and boasts an impressive level of research and relatively slick approach. Still, 8 treads murky waters in its second half, and spends more time than it should on the faith’s general treatment of homosexuality, eventually drifting into an unpleasant streak of overt Mormon-bashing. The film also fails to take into account the many other factors in play during the 2008 election, narrowing events down to one all-encompassing Mormon-based explanation. 8 means well, but is too blinded by its own biases to do its cause justice.